I recently wrote about “Snow White and The Smelly Dwarfs” – but it is Christmas time and I also have a sweet (rather than smelly) Snow White story. This is an except from my as-yet unpublished novel. It’s a fictionalized account of the Christmas when I was five. But it is not so very fictional… the parents in this story are my own Mom and Dad, and I am the little girl with the Snow White doll. “Just vaguely,” I answered, although I knew the story like I knew my prayers. But, oh, to hear it again, especially Angela’s version. Anyway, she gave him our Christmas lists that we had written to Santa, and told him to do his best. On Christmas Eve, it got to be quite late before Mom and Dad started putting our presents under the tree. Mary Ann got the right side, near the piano, and I was on the left, near the door, and your presents were right in the middle, right under the center of the tree. Mom counted every present and made sure we all got exactly the same number of gifts. ‘They’ll count,’ she said, and you know we always did. She actually put away one present for Mary Ann that she saved for her birthday, so it would all be even-steven. She put out books, and games, and lacy socks, and ribbons, and a little horse with hair you could comb for Mary Ann, and a pogo stick for me. Remember that pogo stick? That was my all-time favorite. After everything was laid out and looked so beautiful, Mom sat admiring it all. Then she saw what was missing. ‘Where’s Cynthia’s doll?’ Mom asked Dad. Well, you were five years old. You had never had a Christmas or a birthday without a doll. And Mom made Dad go out again late Christmas Eve to find a doll. It wasn’t like now, where there’re huge stores all open twenty-four hours. No, everything was locked up tight, and Dad drove around the deserted town looking for any store that might be open. And he finally saw a light. It was Noveck’s Pharmacy, and they were open for ten more minutes. And he bought the Snow White doll. And he came home with this doll, and Mom gave him cocoa. And took away your crinoline slip and gave it to you for your birthday, so it would all still be even. The next morning was the best Christmas we have ever had. Dad had interpreted our lists very liberally, and so we got what we had asked for, but in very unexpected ways. Mary Ann had wanted a Liberace record and a jigsaw puzzle, but she had written it on one line, and Dad actually found a jigsaw puzzle of Liberace. And I got real seashells, when I had asked for seashell barrettes. Oh, we were delighted! How sweet! I think we all know the feeling of seeing, for the first time, something that we suddenly realize we’ve “always wanted.” Thanks for putting it into words. Oh thank you so much! Realizing what we’ve always wanted is the centerpiece of my novel. It feels great that you saw that in this little bit. You’ve made my day. Dads buying gifts – you just never know what you’ll get. I had to tell my husband last week that the case of copy paper he bought on sale at Staples was NOT worthy of being called a gift for out 18 year old son. He doesn’t understand why. A Liberace jigsaw puzzle! Who would’ve thought?! I have to confess… the Liberace puzzle is one of the fictional bits of this fiction. 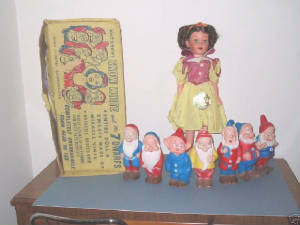 But my Dad’s shopping and the Snow White doll are very real. What a neat gift! I’ve never seen that. I love the expression of realizing what you always wanted is what you now have, even though you never even thought of it before! Very sweet indeed. And even sweeter because your dad did his best…..and it turned out so wonderfully! OMG, what a sweet story! You have quite a knack for storytelling! Can I preorder the novel? I love it already! As soon as I find an agent, and then a publisher, and then an editor… but soon, I’m sure. I want to read more!! I still remember getting those kinds of gifts at that age and it being exactly what I always wanted – like my Rainbow Brite kitchen. It was, well, the shiz. Riveting! Love it. I too would like to see more. Merry Christmas or Happy Hanukkah, whichever way moves you.